The annual back-to-school Ice Cream Social sponsored by the Lakewood Council of PTAs and the Lakewood Board of Education will take place Tuesday, Sept. 4, from 6:15-7 pm in the Garfield Middle School Gym. Members from the two middle school bands will kick things off, then Board members will scoop the free ice cream. You add the fixins! Come enjoy the music and meet your elected officials at this family-friendly event! I would like to take this opportunity to tell you that I am honored to serve as your Superintendent of Schools. 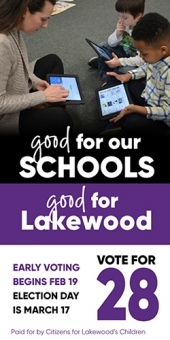 The Lakewood City School District is one of the finest districts in the nation. During my transition to Lakewood, I have learned of its focus on educational excellence, its warm and welcoming spirit, and its unwavering commitment to the children of this community. I would also like to take this opportunity to tell you a little about my family. I have been married to my wonderful wife Laverne for 21 incredible years. Laverne and I have two daughters - Michaela, 20, and Mia, 18. Both will be college students beginning this fall. My wife and I are so very proud of them. I truly believe in the value of education. Education is a fundamental necessity to the survival and growth of individuals, communities, states, nations, and the world. Education is a powerful variable that can transform the conscience of mankind. An educated individual, community, state, nation, and world is one that respects and values diversity, promotes and endorses collaboration, and recognizes the self-worth and unique talents in everyone. Supplies 4 Success, a committee of the Lakewood Area Collaborative, has kicked off this summer's school supply collection drive. Started in 2011, S4S has been instrumental in getting needed school supplies to Lakewood students in financial need. The committee's goal is to have a supply closet in each of our schools for guidance counselors and teachers to access throughout the school year. Public education may not be a fundamental right under our constitution, but it is protected by The Equal Protection Clause of the 14th Amendment. However, as Dr. Greanoff stated, public schools seem to now be on the road to extinction, and it is frightening. A large component of this problem, stems from many politicians and their promotion of the charter school system. The public has been repeatedly misinformed about charter schools. Some think they are private schools, others think children will receive “safer,” or “better” education by attending such institutions. Sadly parents are being manipulated and mislead. Lakewood High School junior Kira Marjanovic has accomplished a feat few women and even fewer juniors accomplish – earning entry into the U.S. Marine Corps Music Enlistment Option Program for eventual placement in a U.S. Marine Corps Band. While middle school students often hear the message about the dangers of prescription drug and opioid abuse as they move through the school year, this year the message was delivered in a new way – by students themselves. Not many live to see their 100th birthday, but Barbara Clarke, Lakewood High Class of 1936, did so in style! 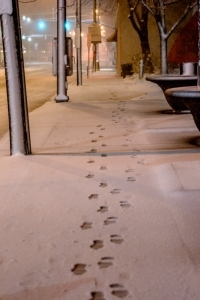 A party was held on March 31 in Chicago, where she moved after graduation to be near grandparents. Barbara worked as an accountant until she retired. In her retirement, she volunteered at the Chicago Botanic Gardens, which dedicated a rosebud tree in her honor for her birthday. Barbara, who currently lives in Wilmette, IL, received letters of congratulations from Lakewood High Principal Keith Ahearn and Chicago Mayor Rahm Emanuel. Cheers to Barbara, and here's to many more! Lakewood High School has been named one of U.S. News & World Report's Best High Schools and a Bronze Medalist for 2018. The magazine awards Gold, Silver and Bronze medals according to college readiness, math and reading scores and graduation rates. Bethany Toth randomly clicked on a link and opened the website for the Public Safety Center of Excellence at Cuyahoga Community College (Tri-C®). The 39th Annual Excellence in Education Awards recognizing students with disabilities, peers, and educators was held May 4 and included recognition for two Lakewood Schools students and staff member Neil Rupright. The event is planned by the ESC of Northeast Ohio and the State Support Team – Region 3 to recognize the great work being done by educators, teachers, students, and community members in special education. The Lakewood Council of PTAs handed out its annual awards at a ceremony on May 2 at Harding Middle School. The ceremony included awarding four senior scholarships, honoring teachers of the year at each building, and recognizing the District’s Educator of the Year, Sarah Csongei, who also was named Ohio PTA’s District 11 Educator of the Year. The Lakewood High School Barnstormers Drama Club will perform its spring musical, "1776", on three successive evenings from May 3-5. The show begins at 7:30 pm in the Civic Auditorium each night. Tickets to see this story about our country's Founding Fathers are $8 in advance and $10 at the door. Tickets can be purchased in advance by calling the LHS Bookroom at 216-529-4047 or stopping by during school hours. Congratulations to the Garfield and Harding Middle School Mock Trial teams, who on April 20 earned top ratings at the statewide Middle School Mock Trial State Showcase sponsored by the Ohio Center for Law-Related Education held in Columbus. Both Garfield 7th grade teams and the Harding 7th grade team earned the highest Superior rating and Harding’s 8th grade team narrowly missed the top rating and earned an Outstanding rating.